Of course, none of these animals are alive. They are all only images and monuments. In the mid-nineteenth century, California was home to as many as ten thousand living, breathing grizzly bears-a greater population density than in present-day Alaska, and around a fifth of all the grizzlies in the United States at the time. Zoologists believe that the California population constituted a unique subspecies: the California grizzly, or "chaparral bear," a label that referred to its affinity for the region's scrubby foothills and brush-covered mountains. The chaparral bear's numbers seem to have peaked around the time of the gold rush, in 1849, then plummeted during the second half of the nineteenth century. The last captive California grizzly died in 1911, and any remaining wild individuals probably perished before 1930. By the time it went extinct, the California grizzly had become an indelible icon. It appeared on the state flag and seal. Artists had immortalized it in paintings and murals. The University of California had adopted it as a mascot. And hundreds of monuments commemorated its role in the state's Indian, Spanish, Mexican, and early American histories (see figure 2). Today the grizzly's image appears on pendants and billboards and is inscribed on T-shirts and logos, carved in stone, and cast in bronze. These representations are all that remain of the chaparral bear. Most people hardly notice them. Yet references to the California grizzly-a once-celebrated totem now vanquished, extinct, and largely forgotten-remain a ubiquitous presence in the lives of millions. The California grizzly went extinct long before conservationists coined the term endangered species. Its story can serve only as a prelude to the debates that followed and that are the focus of subsequent chapters in this book. Yet the epic history of the grizzly bear in California, in addition to offering a grand tale of the American West, illustrates a crucial point for understanding more recent endangered species controversies. Although debates about wildlife extinction and conservation have changed much over the years, one thing remains the same: they have always been about the politics of place. In California there is no better species to illustrate this essential insight than the one most closely associated with the state's indigenous history, colonial encounters, frontier origins, early development, political symbolism, and contemporary cultural landscape. In the spring of 1889, the reporter Allan Kelly left the cosmopolitan comforts of his San Francisco home bound for the rugged mountains of Ventura County in a still-remote corner of Southern California. He worked for the San Francisco Examiner, and his boss, William Randolph Hearst, had sent him on an extraordinary assignment. Kelly's goal was to capture and return with a live California grizzly bear. Doing so would prove the animals still existed. It would also enable Kelly's ambitious employer to generate publicity for his newspapers by presenting the citizens of San Francisco with a marvelous gift. Kelly was a quick-witted observer and eloquent author. He loved the mountains, penned self-effacing accounts of his outdoor misadventures, and wrote about people and animals with humor, precision, and respect. According to Kelly, Hearst had selected him for the job because although the reporter had no experience as a trapper, he was "the only man on the paper who was supposed to know anything about bears. "2 Hearst sent Kelly on the expedition only after having tried and failed to purchase a captive grizzly, for which he would have fabricated a harrowing tale of pursuit and capture. As Kelly would discover on the publication of his own heavily edited grizzly story, Hearst made a habit of encouraging his employees not to allow the facts to constrain their imagination. Kelly set out for the little farming town of Santa Paula, where he would begin his adventure, in May. He spent a month in the area learning to build bear traps from stout oak beams, to ignore the locals' eccentric advice, and to distinguish real paw prints from the fake ones left by his untrustworthy advisers. By June he was ready to proceed, and he moved to a camp at seventy-five hundred feet on the forested slopes of Mount Piños some forty miles to the north. Three grizzlies visited Kelly and his assistants during their time on the mountain, but none of the bears took the crew's bait or wandered into the traps. In July Kelly's editor at the Examiner decided that the adventure had gone on long enough and ordered his reporter back to San Francisco. Kelly pleaded for more time, but the editor responded by revoking his funding and suspending his salary. With no assistants and no support, the unemployed journalist was on his own. 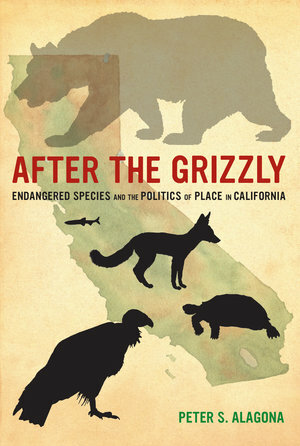 Focusing on the stories of four high-profile endangered species—the California condor, desert tortoise, Delta smelt, and San Joaquin kit fox—Alagona offers an absorbing account of how Americans developed a political system capable of producing and sustaining debates in which imperiled species serve as proxies for broader conflicts about the politics of place. The challenge for conservationists in the twenty-first century, this book claims, will be to redefine habitat conservation beyond protected wildlands to build more diverse and sustainable landscapes. Peter S. Alagona is Assistant Professor of History and Environmental Studies at the University of California, Santa Barbara. He was Visiting Assistant Professor at Stanford and Beagle Environmental Fellow at Harvard and previously worked as a national park ranger and as a consulting ecologist. Since 2009, he has been an Associate Editor for the MIT Press series Histories for a Sustainable Future.